I don’t eat seafood, Jen! 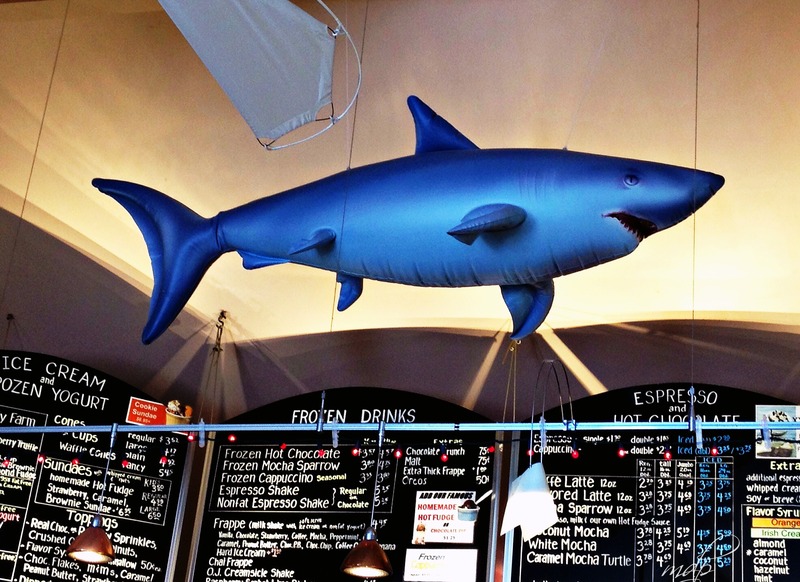 My school’s mascot is the shark – I’d stick with the espresso. And a lemon twist. Wow, Clay. A shark is some mascot. Lemon twist with espresso? That sounds refreshing, actually. Shark Frappe’ anyone?. This must be a Blue Shark and by today’s information seeking boffins, the biggest animal in the world. Or was that the Blue Mammoth? You got it, B! Platter of cheeses all around. He probably just swam by for an ice cream. It is summer, after all. And the ocean was so near by . . .
That’s pretty much what I ordered. I also skipped the sugar, though. I am afraid that publishing all these articles in only going to encourage the bubbas to load up the boat with bait, ice and beer and go fishing. Shark fishing. Fortunately, I don’t eat seafood in general, and sharks in particular.